The laboratoy mouse (Mus musculus) is a model organism studied in biology laboratories. The laboratoy mouse is an eukaryote, a mammal in the Rodentia order and the Muridae family. The laboratoy mouse is a mammal measuring 7 to 10 centimetres long, weighing from 20 to 50 grammes. It has a pointed snout and a tail that can be as long as its body. In its natural environment, the mouse is called domestic, because it lives near or in dwellings homes. It has a linear double-strand DNA genome with 3.4 billion base pairs shared over 20 pairs of chromosomes. It multiplies quickly, since it reaches sexual maturity after about forty days and gestation lasts 18 to 21 days. A female can thus give birth to 18 young per litter (in general, between 5 and 12) every six weeks. There are many stocks, or lines, of Mus musculus, with different characteristics and different coats. 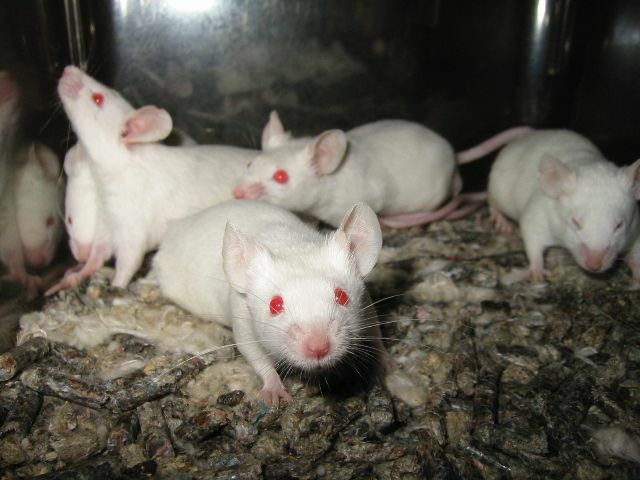 The mouse is the mammal most often used in animal experimentation, especially in medical research.